Our Ballistic Groin Protector is designed to offer law enforcement a wider range of protection in the groin area. The Bullet Resistant Men's Groin Protector will protect you from scratching, biting, strikes to the groin, and handgun rounds up to a .44 magnum. As an added bonus, our product also has a built in holster for a backup handgun and an extra magazine. This holster has a Dupont Kevlar panel inserted to stop handgun rounds, but it can also be removed if you just want to have a holster for handgun carry. 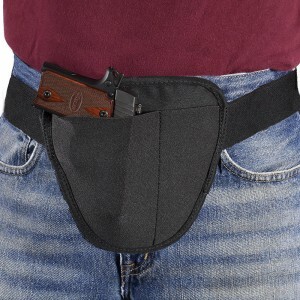 Note: The handgun does not need to be carried in the groin, this is simply an option. Our product is proudly made in the USA and is backed by our 5 year warranty for craftsmanship!